Biographical-Documentary Project "Piotr Bozyk (1912-1989)"
I am writing to ask you about a very great favour. Could you help me please find information about my uncle Piotr Bozyk. I and my mother Katerine Hnatyk(Bozyk)-his sister were looking for him during the long years. And now at last we were informed through Red Cross that he lived in Kalgoorlie.Western Australia. I want to lescribe you the situation with Piotr Bozyk. He was born in village Novosilky or near Yavoriv.Lviv, Poland (pre-WWII) in what is today Western Ukraine. He was born on 17 may 1912. Since 1942 the german fashists have compulsory moved out to forced labour into Germany. In 1945 we have got a letter that he is living and when he will go out so he will write to us obligator. But conditions were changed: our Ukraine must be found under the communist power in the Soviet borders were closed at so called "iron curtain" from the Western Countries. 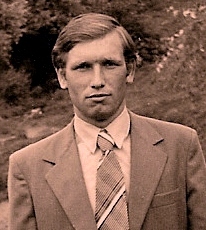 In 1991 our Ukraine became an independent state and we decided to write a letter to the International Tracing Service and at last we got an answer that Piotr Bozyk lived in the town Kalgoorlie and died on the 7th june and was buried on 9th of june 1989 on the local cemetery in the city Kalgoorlie. Western Australia. Marital status single. -German propaganda for the Ukrainian exit to work before the Third Reich in village Novosilky.Jaworow.Lwow. -Hitlerites deportation for forced labor in Germany in the village Novosilky.Jaworow.Lwow. -List of people deported to forced labor to Germany to work with village Novosilky.Jaworow.Lwow. -List of prisoners to the Police prison Salzburg (in days 2,3,4,5,6,7 September 1943) "Polizeigefangenenhaus Salzburg"
-9.6.1950-17.5.1977 Piotr Bozyk railway worker (WAGR). Kalgoorlie.Western Australia. © Biographical-Documentary Project "Piotr Bozyk (1912-1989)"